A few folks have asked about the photo that inspired the name for my new blog. I’ve discussed this a bit in the “about” section, but given that most folks won’t spend a lot of time poking around my new blog, I thought I might as well make the photo the topic of today’s blog post. The short answer is, yes it is an actual photo that I took a few years ago on a trip to the town of Wenatchee, Washington which is east of the Cascades in the central part of the state. I had never been to Wenatchee before, a town with a rich history that includes the Sisters of St. Joseph of Peace. In 1916 the Sisters were invited by Bishop O’Dea of Seattle to take over the Wenatchee General Hospital, which they ran as St. Anthony’s Hospital until the 1970s. Many of my favorite CSJP Sisters ministered at the hospital, including my friend Sister Monica who started there as a young Sister in the 1950s as a bookkeeper before becoming and RN, a hospital administrator, and eventually CEO of our health system. Given our rich history there, I took the opportunity of giving a presentation at a parish in Central Washington as an opportunity to make a sort of pilgrimage. I visited the site of the original hospital (now a home for disabled adults). I also visited St. Joseph School, which was started by our Sisters in the 1950s. The last CSJP left the school in the 1980s, but my friend Sister Tonia stayed on in Wenatchee working with the diocese until a few years ago. 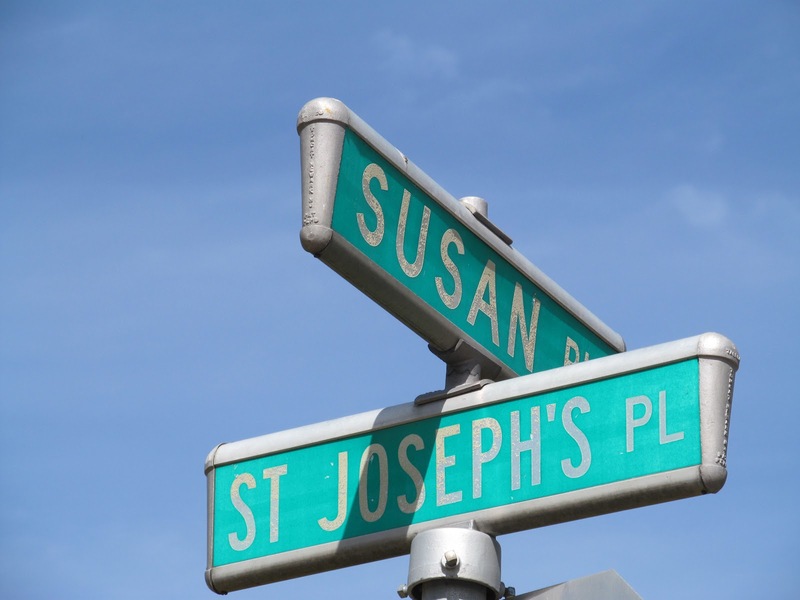 Now we get to the part of the story you have been waiting for … the discovery of the corner of Susan Place and St. Joseph Place. After parking near St. Joseph’s school and walking around, I returned to my car and discovered that this was where I had parked! The synchronicity of the moment struck me then, and the picture I took that day has given me many opportunities to contemplate in deep gratitude this wonderful adventure God has invited me to participate in. When I was thinking of a name for this new blog to mark the beginning of a new adventure, the picture naturally came to me as perfectly capturing this moment and the many blessings in my life as Sister Susan, a Sister of St. Joseph of Peace. 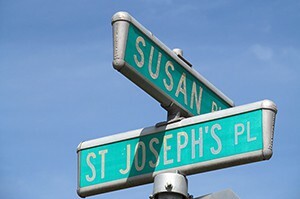 Really, I can’t think of a better place to be than at the corner of Susan and St. Joseph, pursuing social justice as a path to peace.